There weren’t nearly as many fun sites for families to explore in Phoenix when I was growing up there as compared to what exists today. When I return with my two kids to visit family each year, I love discovering the newer child-friendly Phoenix-area attractions as well as revisiting old-school favorites. Here are four Phoenix attractions for kids that are sure to please the whole family. I don’t know what it is, but most young children are down-right enthralled by trains of all sizes! My toddler son, Leo, is particularly loco for locomotives, so the McCormick-Stillman Railroad Park was a must-see during our visit to Phoenix last fall. This Scottsdale park is a great place to just let the kids get their wiggles out during a short visit. Or, you can make a day of it by grabbing hotdogs and hamburgers at the Snackstop or packing a lunch to enjoy at a picnic table while watching the choo-choo chug past. The highlight of a visit here is climbing aboard the park’s miniature steam train for a winding ride through the grassy park. Afterwards, kids can frolic about at the park’s elaborate playgrounds before taking a spin on the Charros Carousel. My kids loved Hartley’s General Store, which sells hand-dipped ice cream and an array of train toys. It houses a Thomas the Tank Engine table stocked with wooden trains and tracks for hands-on playing. A model train that encircles the store adds to the fun. Kids love to sit in the enclosed train car for some odd reason…Don’t worry, there are plenty of open-air cars to choose from too! The Hall of Flame Firefighting Museum boasts the world’s largest collection of vintage fire trucks, ranging from a 1725 English hand pumper to more modern engine-powered models. This attraction will probably take about one hour to explore with young children and up to two hours with older kids who have more patience for reading the displays. You could combine a visit here with a day at the Phoenix Zoo, which is located just across the street. My family made a game of our visit by having everyone select his or her very favorite fire truck from among the museum’s more than 90 vehicles. Most of the trucks are strictly hands-off, which made wrangling two curious youngsters a wee bit nerve-wracking. There is one climb-aboard fire engine for make-believe, albeit stationary, rescue missions. There is also a touching memorial to fallen fire rescue heroes, with a special display for those who died in the September 11, 2001 terrorist attack on the World Trade Towers in New York. I have been to my fair share of science museums, and let me tell you, the Arizona Science Center in downtown Phoenix rocks! 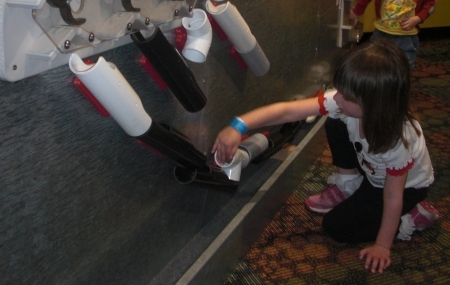 With hands-on experiments complete with nobs to crank and buttons to push, children are too busy having fun to realize they’re learning something too! You definitely could (and should!) spend a whole day exploring the center. 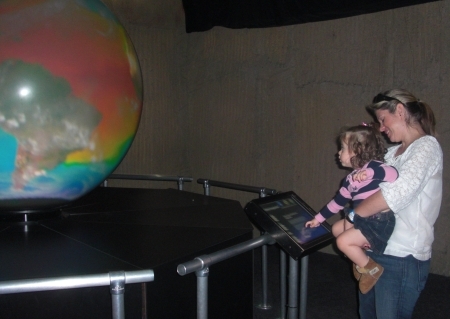 The coolest part is the Forces of Nature exhibit, which simulates natural phenomena for those brave enough to step aboard the “stage” to experience the five-minute show (which repeats every 15 minutes). It was too scary for my toddler and preschooler, but I saw lots of school-aged kids, teenagers, and adults nervously laughing as they experienced a (mild) earthquake, wind storms, thunder, lightning, and more. If pressed, I would say the Arizona Museum of Natural History is my favorite of these four attractions. This museum, located in Mesa, will probably take about half a day for your family to enjoy. Most impressive is Dinosaur Mountain, a display of life-sized animated dinosaurs on a cliff with booming “flash floods” that send water gushing down the display every 23 minutes. Be sure to head outside to participate in my daughter’s favorite activity at this museum – panning for gold! At this museum, you can wander through the Lost Dutchman Mine exhibit and “lock up” your family members in its jail cells. Then explore a Hohokam village, stopping to grind some maize with stone tools and put together giant puzzle pieces to form pictures of Native American pottery. As you can see, Phoenix isn’t just about shopping and golf. There are plenty of fun, educational attractions for families to enjoy during a visit to the Valley of the Sun! What is your favorite Phoenix-area family attraction? Let us know in the comments!